A fun, accessible chapter-book debut from an exciting new talent--simultaneous hardcover-paperback launch! 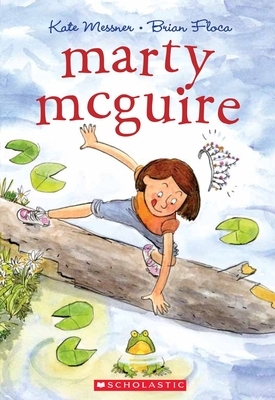 Marty McGuire would rather spend recess catching frogs in the pond than playing dress-up with the other girls in third grade. So when her teacher casts Marty as the princess in the class play, Marty's absolutely, positively sure that there's been a huge mistake. But after a special lesson in the art of improvisation, Marty comes up with her OWN plan to IMPROVE the play: Why use stuffed-animal frog onstage when a live one would be so much better? In the end, Marty's one-of-a-kind performance makes for an unforgettable show. Maybe Marty CAN live happily ever after, after all! Kate Messner is the author of THE BRILLIANT FALL OF GIANNA Z., winner of the E. B. White Read Aloud Award for Older Readers; SUGAR AND ICE; EYE OF THE STORM; CAPTURE THE FLAG; SEA MONSTER'S FIRST DAY; OVER AND UNDER THE SNOW; and the Marty McGuire chapter book series. A former middle-school English teacher, Kate lives on Lake Champlain with her family and loves reading, walking in the woods, and traveling. Visit her online at www.katemessner.com. Brian Floca is the author and illustrator of MOONSHOT: THE FLIGHT OF APOLLO 11 and LIGHTSHIP, both Sibert Honor Books. He has illustrated Avi’s award-winning Poppy series and, most recently, Jan Greenberg and Sandra Jordan’s BALLET FOR MARTHA: MAKING APPALACHIAN SPRING. Brian grew up in Texas and now lives in Brooklyn, New York. Find him online at www.brianfloca.com.